Halloween falls on a Thursday this year, so chances are you’ll be attending several parties in the next few days (Halloweek, anyone?) This is great news if you can't decide on just one costume, but less so if you’re trying to watch your waistline. Endless platters of candy and spooky baked goods make these parties potential diet landmines. 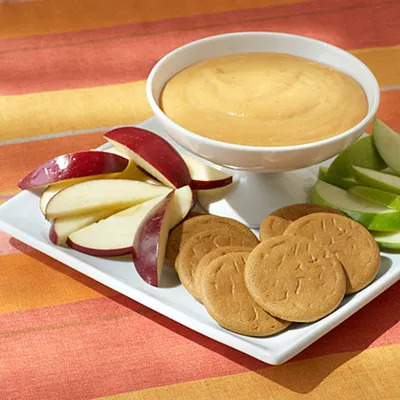 So if you’re feeling less than confident in your treat-resisting abilities, try showing up with a healthy (but equally fun) option, like this pumpkin dip. Unlike a lot of pumpkin flavored treats, this dip is made with actual pumpkin, giving it a very holiday-appropriate orange hue. Plus, one serving will only run you 107 calories--that's including the apple slices for dipping. If it’s between this and a Reese's peanut butter cup (approximately its caloric equivalent) we’d choose the yummy pumpkin dip every time.